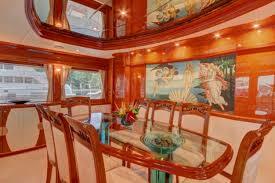 Split-level Full Beam Main Deck Master King + Full Beam VIP King + 1 Guest Queen + 1 Twin, each with private bathroom. Queen size bed in VIP Guest stateroom forward. Double bed in guest stateroom below, starboard. 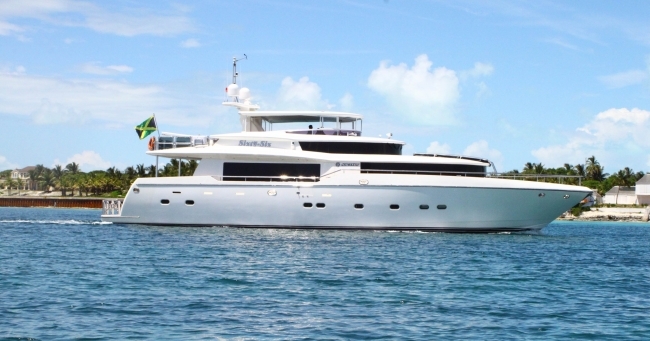 After April, 25th 2017, Sixty Six will be available for charters in the Bahamas through the Spring of 2017. Heading north up the East Coast only to the Cheasapeake Bay area, this gorgeous, highly varnished, wooden-panelled, 87′ Johnson, SIXTY SIX, is currently confirmed May through October 2017 in Florida/ Bahamas and East Coast to the Cheasapeake Bay area. Designed by famous British design team, Bill Dixon, and built in Taiwan in 2002, the Johnson line is intended to have a lot of character. As well, they’re extremely well-built and have a lot of interior volume, compared to yachts their size. SIXTY SIX is a flybridge version, her steering controls being outside, she is intended to be sailed in tropical waters. During 2015 SIXTY SIX completed a refit, and her classically appointed main saloon with highly varnished bulkheads shines like the sun! There must be 25 coats of varnish on her interior walls; I mean ‘high gloss!’ It’s fabulous! White carpets, leather settees, and tray ceiling complete the assignments there. SIXTY SIX is one of the most romantic vessels around! 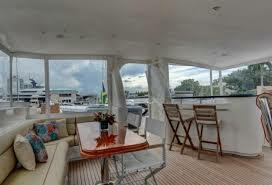 Her dual-level master cabin is WOW! 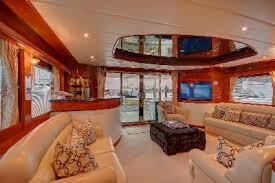 This full-beam stateroom, located on the main deck with windows all around is unlike any other. 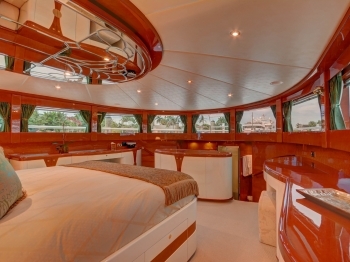 A King size bed faces forward through windows overlooking the bow! A spiral staircase leads downstairs to a spacious dressing room with glass steam shower and his and her baths and sinks. The yacht’s beam allows this cabin to be decent-sized. Two identical guest cabins are amidships in a separate compartment, one with Queen, the other with Twins, and all have ensuite bathroom. The fourth guest cabin is the full beam of the ship and also has a King. Being a flybridge motor yacht with teak decks, SIXTY SIX has no skylounge, but the sundeck fully encloses with retractable awnings and weather curtains and features a bar with stools, bridge steering, U-shaped seating around a dining table, and opens to a Jacuzzi aft. Sunbathing cushions are available on the coach roof. British captain Glen Smith is a life-long sailor with training in electrical engineering and is a qualified Yacht Master with over 17 years of experience. Glen’s other half, Clare Gerwell, chef, is a Jack of all Trades, seasoned traveler, and extremely nice person. They pick up an experienced first mate plus stewardess for charters.